At approximately 21-metres high, Altitude44 comprises of four giant-sized platforms within which sit 44 fun obstacles of all different shapes and sizes, which will have a distinctly seaside theme. With this major new attraction included, East Lindsey District Council has invested almost £1-million into leisure facilities in Skegness in the last 12 months. Working with partners, the Magna Vitae Trust for Leisure and Culture, the council has refurbished the town’s Pool & Fitness Suite and supported the new “Upstairs at the Embassy” VIP and entertainment function space at the theatre. All are operated by Magna Vitae. Meanwhile, in another new development, a separate investment by Magna Vitae will see the complete refurbishment of the current refreshment kiosk, which sits next to the Skegness outdoor pool and the site of the new high wire. Accessed from Compass Gardens, the new eatery will serve authentic stone-baked Italian pizza and is partnering with the Costa ‘Proud to Serve’ brand. 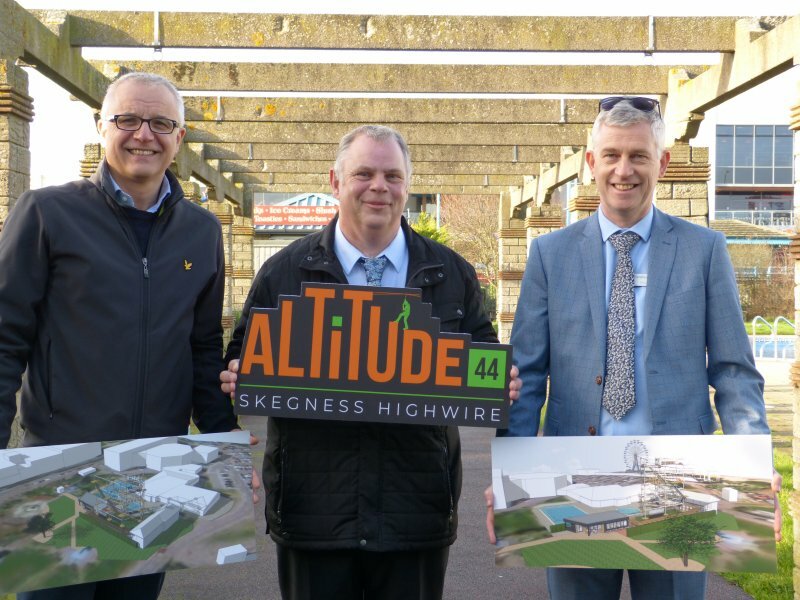 Welcoming the new development, Councillor Steve Kirk, the Portfolio Holder for Coastal Economy at East Lindsey District Council said: “I’m delighted to see that Altitude44 has been given planning permission. This will provide a brilliant new attraction in Skegness and, I’m sure, will be a unique experience for those who tackle it. Although, at nearly 70 feet high, I don’t expect to be one of them anytime soon unless, of course, there is a sizable donation to the Mayor’s charity first! “Altitude44 is yet another wonderful project brought forward by Magna Vitae in partnership with ELDC. This substantial investment by the Council comes hot on the heels of recent investments including the refurbishment at Skegness Pool and Fitness Suite and the Upstairs at the Embassy project, along with the upcoming Tower Esplanade and Rockery Gardens improvements. This will be one more great reason for people to visit our wonderful town,” he added.